Real Estate talk is always a hot topic. Maybe you are saving towards buying your first family home, or investing in a rental property. No matter what it is, there seems to be so much to know! 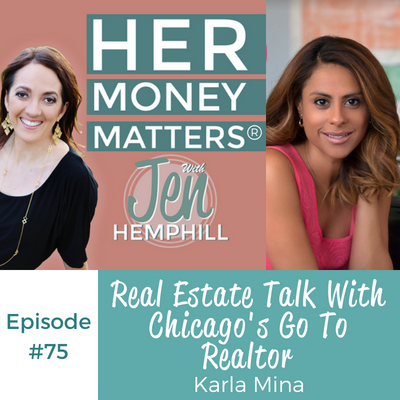 That is why I brought a special guest expert who is the “go to” realtor in Chicago. Ok so I gave her the title, but seriously she is a superstar in Chicago! Press play and get to know this superstar! Be sure to join us in our FB Community to continue this conversation! Hey Jen! I’m new to your site and came across this podcast. I’m already working in the Chicago market, so Karla was definitely speaking my language. Plus I feel like I have to explore the VRBO and AirBnb’s now. Thanks for bringing her on! I am looking forward to listening to more of your podcasts. Good to hear this Sidney. Thanks for listening and love that you will be listening to more :). Great podcast! I’m curious as to what the best way to find investment properties is? Should I look for foreclosures?